We left Canada and made the trip south. The crossing back into the US wasn’t as smooth as the trip coming into Canada. The ‘all-business’ border agent asked us a slew of questions. I don’t know why, but we both seem to get nervous even though we have nothing to hide. He asked us if we had any citrus fruits and I said a lime. It was all over from there. We had to pull over and the agent came onboard. He confiscated two limes and one tomato. Mike had to open up all of the underside compartments and after a few more questions, he finally let us get on our way. He didn’t seem to care about the wine we were bringing back in; didn’t even make us pay a duty. 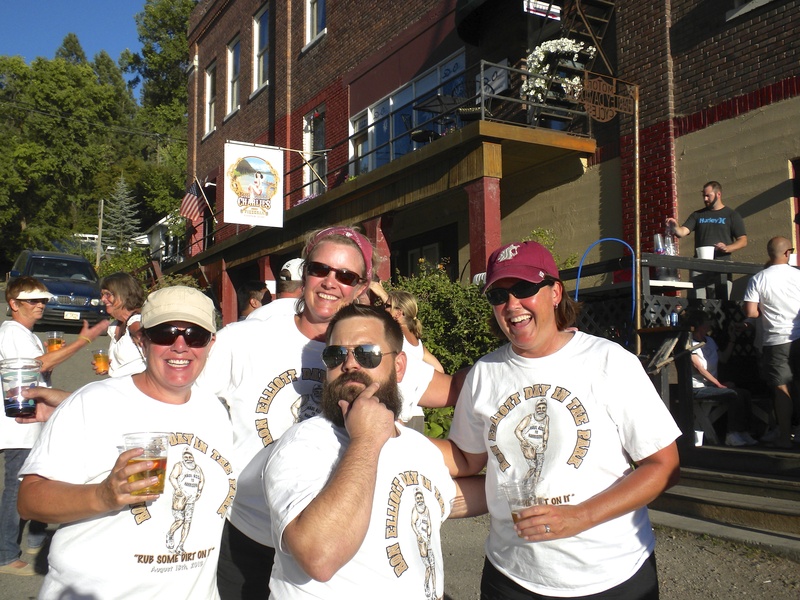 We stopped in Sandpoint, ID; just a place to sleep and do some much needed laundry. 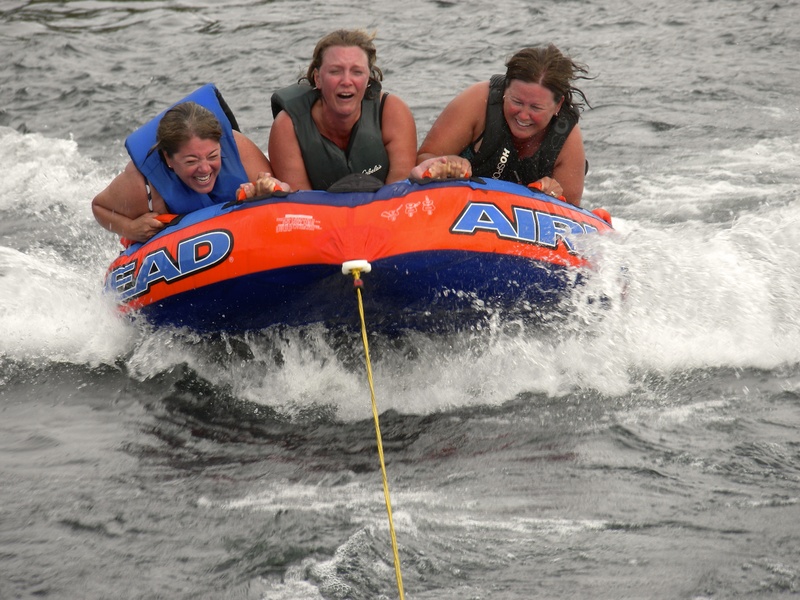 The next day we headed to Coeur d’Alene to surprise the Cameron’s and Pflugrath’s who were there golfing. Turns out they weren’t all that surprised and figured we would probably show. 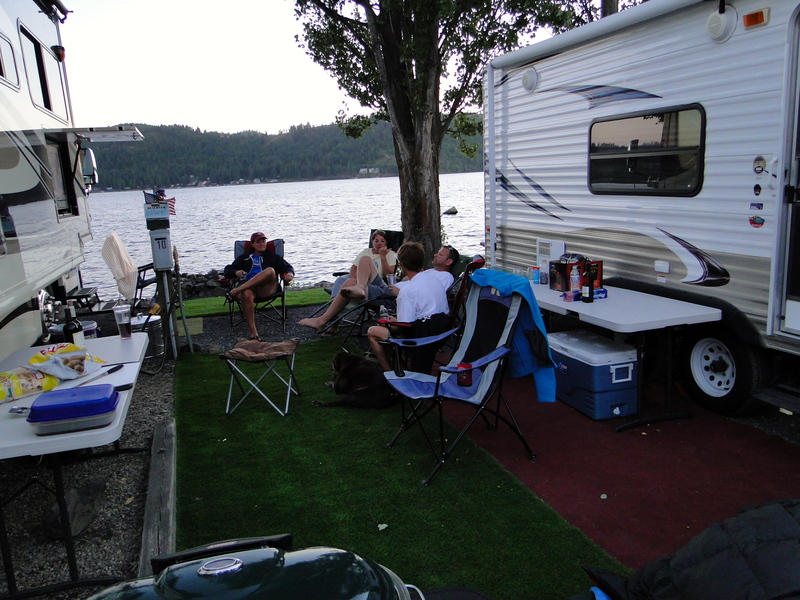 We stayed at a great RV park right on the river, Blackwell Island, and all went out for a tasty dinner that night. The next day it was off to Harrison, ID. I actually rode with Shelly and let Marc ride in the MoHo with Mike. It was a nice break for me – no anxiety along those windy roads! We were there for a celebration for Shelly’s dad, Ron, who lived in Harrison. He passed away this spring and his wife Barb wanted to have a big party in his honor – “Ron Elliott Day in the Park.” They are both well-known in this small town, so the event was very well attended. Harrison is one of those little gems of a town that many people haven’t heard of. Our RV spot was right on the lake and just couldn’t be beat. We ended up extending our stay until Thursday morning even though most everyone else left on Monday. 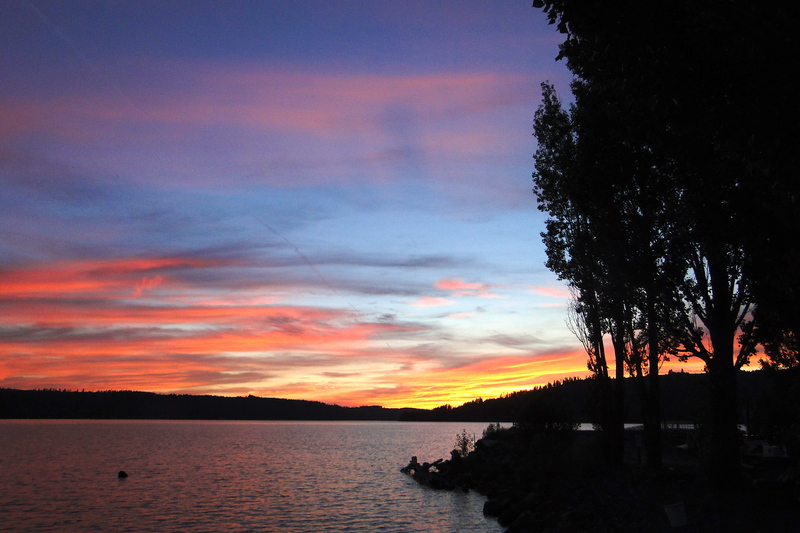 We enjoyed the nightly sunsets and laid back atmosphere. And, what a great party that Barb had in honor of Ron! Not a bad place to spend a week! 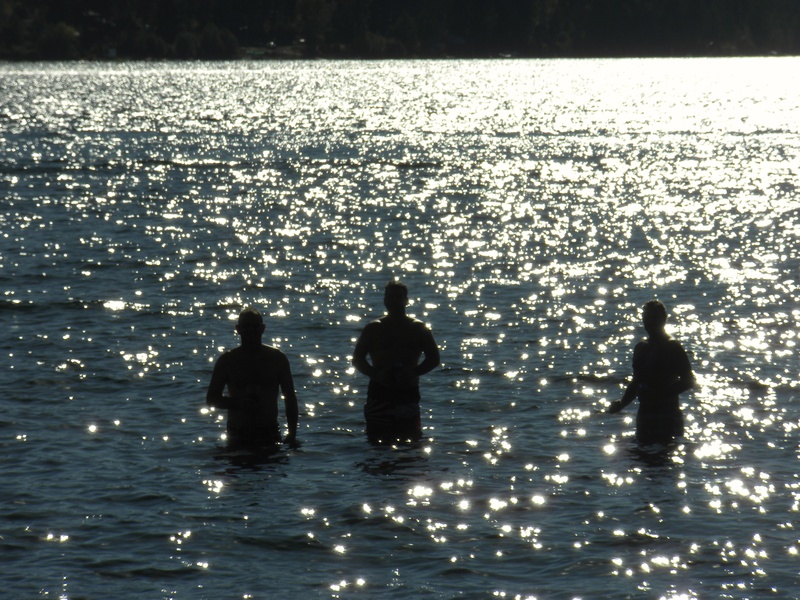 Our plan for the next few weeks includes a weekend at Camp Cameron in Yakima for a golf tourney and relaxation with friends. Then it is back to Seattle/Bellevue to regroup a bit after being out on the road for 3 ½ months. MoHo and car maintenance, restocking supplies, dentist appt’s, hair appt, time with friends and family and Mike’s much anticipated Husky Stadium home opener against Boise State (Go Cougs vs. Auburn!). We’ll be tailgating on the 31st and anyone interested is welcome to join us. We probably won’t blog until we are back out on the road Sept 9th. This entry was posted in August 2013 and tagged Coeur d'Alene Idaho, Friends, Harrison Idaho, Husky Stadium, Ron Elliott on August 23, 2013 by Traci. Warning – this is a long one! I have been waiting for this part of the trip! 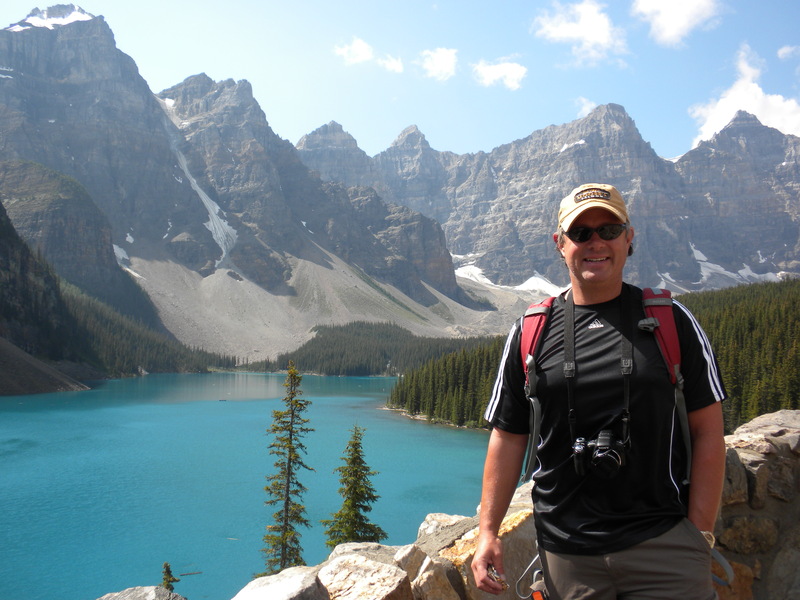 Working at Holland America and Princess, I have always known about the Canadian Rockies and have had it on my bucket list for a long time. I have seen many a photo and written/edited many itineraries, but now I actually have a personal experience to attach to these places I have always seen in a brochure. Mike has been through this area, but back in the 90’s and it was a quick trip, so he was also looking forward to exploring the region in depth. We arrived to Jasper National Park in a pouring rainstorm. There are no commercial RV Parks in the national parks, only campgrounds, so we checked in at Whistlers Campground. 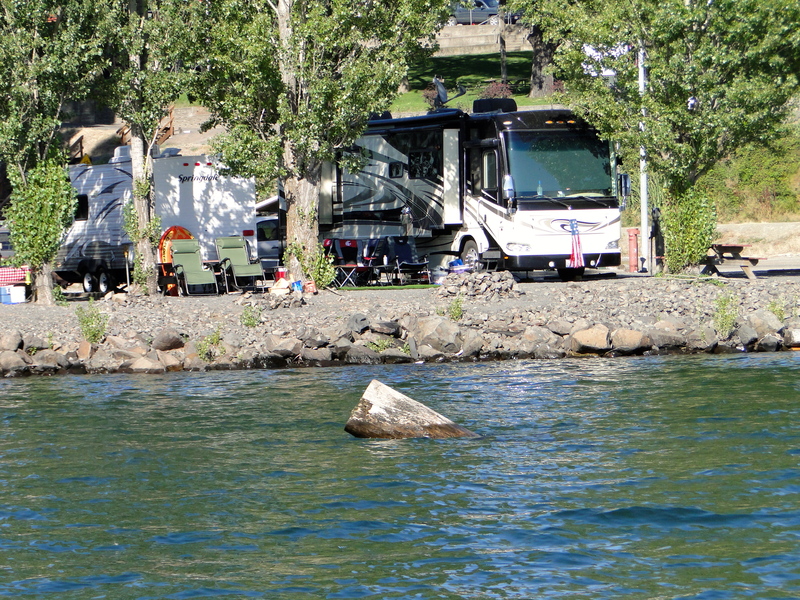 We were excited that we weren’t as packed in as some of the RV parks and it had a more ‘wildernessy’ feel. But, what comes with that is no power, no water, no sewer and no wi-fi. We were boondocking! It was a nice change for us to really be disconnected (except for the occasional wi-fi connection at restaurants in town). We played a lot of Backgammon in the evenings! The next day, we were ready to explore! Headed into town and the Jasper Visitor Center to get our maps, literature, etc. Made a quick stop at the Fairmont Jasper Park Lodge to check out the property and see what golf would cost. Too expensive, but what a great, serene setting for this hotel. 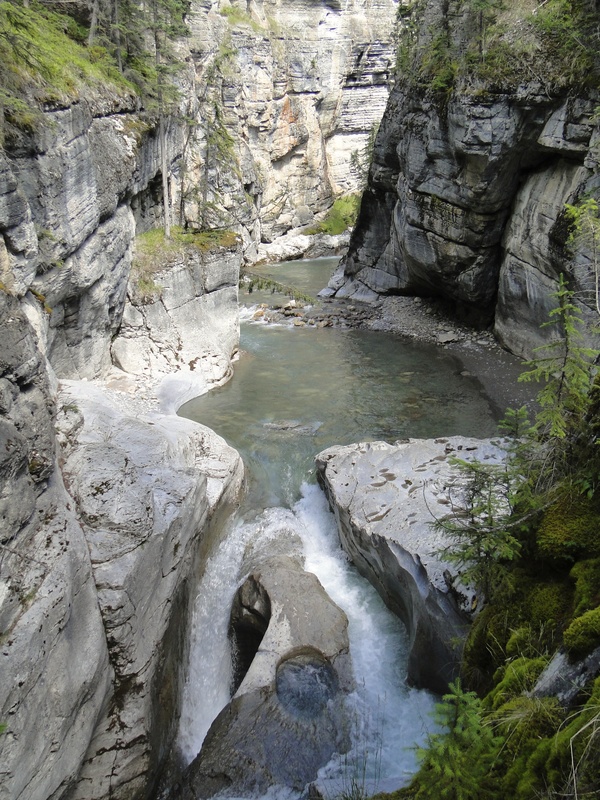 Decided on a hike up to Maligne Canyon which is a steep, narrow canyon, with a flowing river rushing through. We ended up on a side trail and my imagination was running wild. Everywhere, there were warnings about bears and I was convinced we were going to run into Smokey. We had our Bear Spray at the ready, but nothing to worry about. We left and decided to explore a bit by car. The scenery was just amazing. 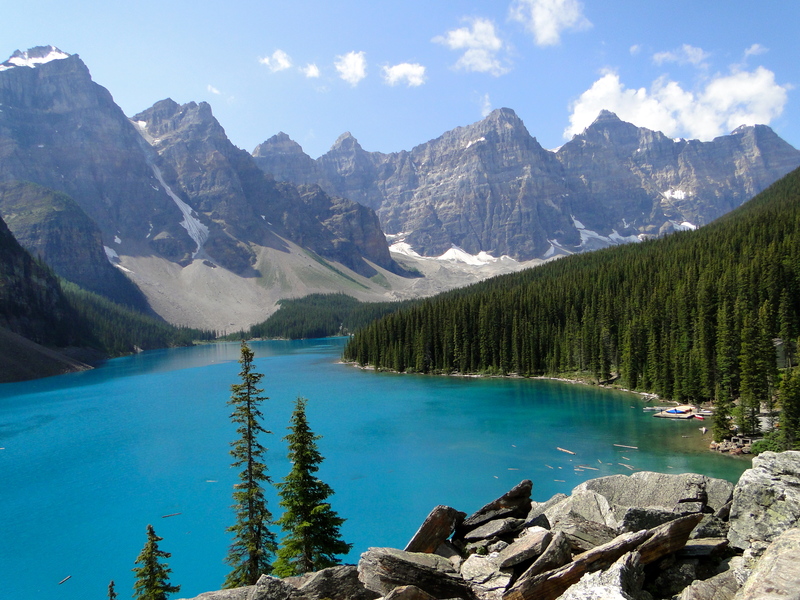 Craggy mountains capped with glaciers, rushing rivers and crystal clear blue lakes around every corner. We stopped at Pyramid Lake for a short walk and just enjoyed the killer views. Headed back into Jasper and the Jasper Brewery for dinner and a couple of ice cold beers (and free wi-fi). A great day! The next morning we decided to drive toward Banff along the Icefields Parkway. We would be heading this way the next day, but we are not able to stop at many of the sights when we are in the MoHo and towing the car. So, we would be backtracking a bit, but we are much more flexible when we have the Acura only while the MoHo is back at the campground. 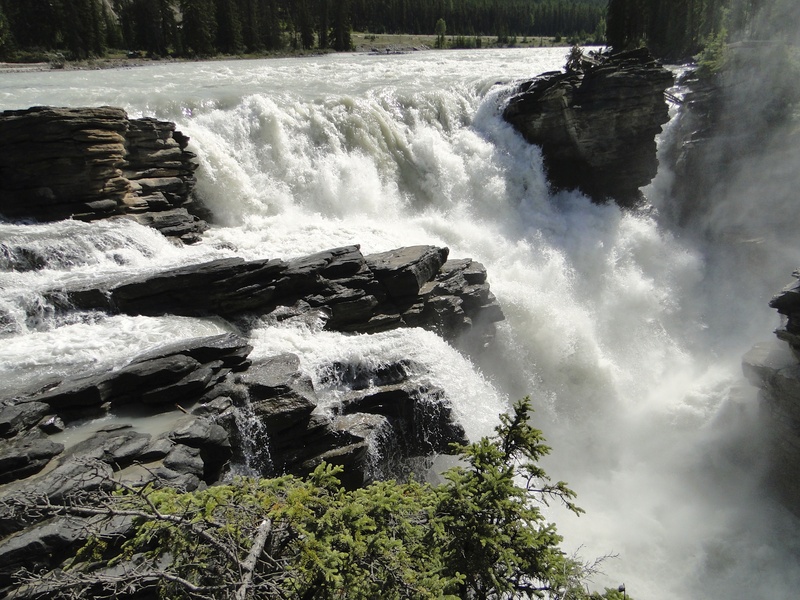 We stopped at Athabasca Falls, which was pretty impressive. I would not want to be caught on the topside of the river with that thing in front of me. POWERFUL! 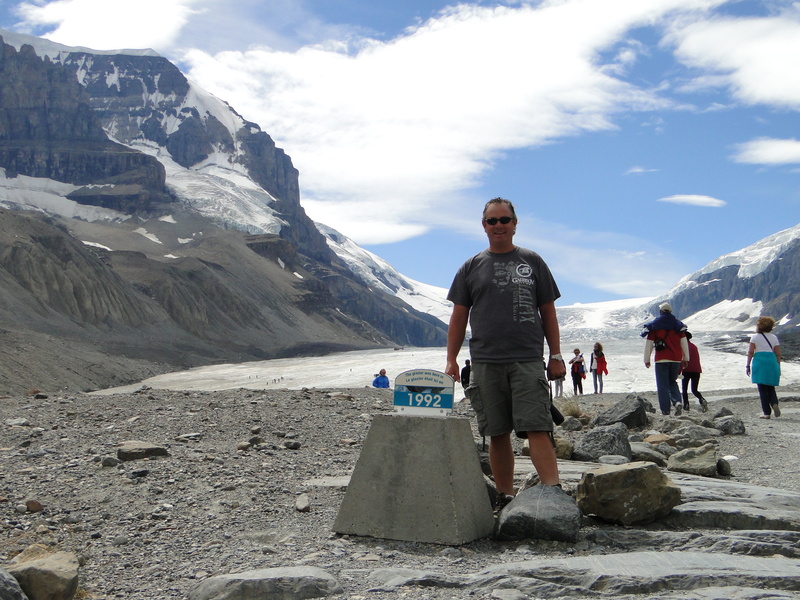 We continued down the Parkway to Athabasca Glacier and the Columbia Icefields. This is one of those sites I have read about so many times, but until you see it, it just doesn’t even compute. It is the world’s most accessible glacier. This is where you can pay to ride on those Ice-Coaches with the huge wheels that drive right onto the glacier. We decided against that and instead hiked the trail and like everyone else, walked under the rope and onto the front of the glacier. Me being the worry-wart didn’t want to do it, but Mike really did, so off we went. He said, “What happened to the girl that jumped out of an airplane years ago?” I am more cautious in my older age, but that comment got my attention! They say the ice is thicker than the Eiffel Tower is tall, so I decided we were probably safe. Once we were on the glacier it was amazing how cold it got. The glacier itself was HUGE. There were signs showing how much it has receded every 10 years. Mike was here back in the 90’s, so we took a picture at the 1992 sign and it must have been at least 100 yards from where the glacier is now. This was a very cool stop. We headed back toward Jasper and decided on one last stop. 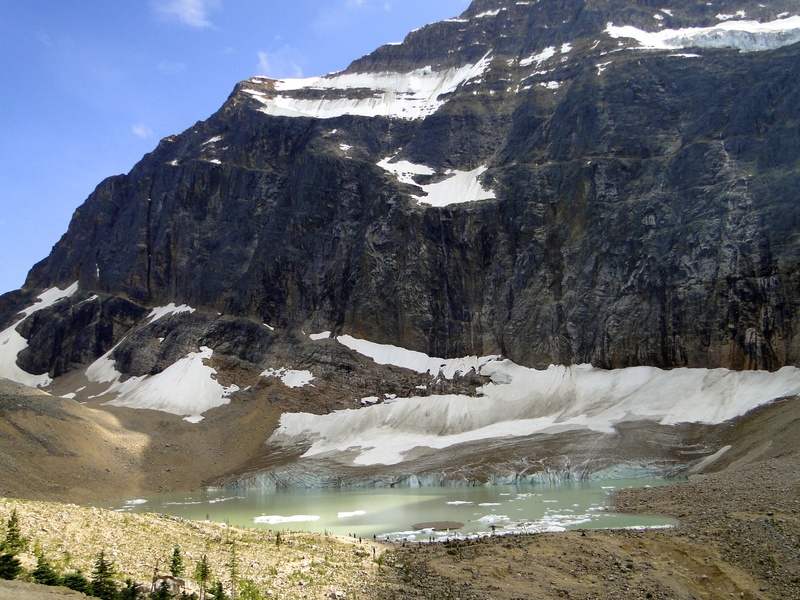 There was a mountain that I had been intrigued by from the moment we arrived – Mount Edith Cavell. It appears to have horizontal stripes across it from the snow/glacier. So, we decided to go get a closer look. We took a 12km, very windy, steep drive up to the trailhead. We then walked the trail up to a viewpoint, which showcased the mountain, angel glacier and an amazing glacier-fed lake surrounded by thick glacier walls. So worth the trip – a hidden gem! Apparently last year a large portion of the glacier broke off into the lake and caused an immediate flash flood due to the lake overflowing into the valley to another lake below and caused it to raise 6 feet. Fortunately it happened at night and no one was there as it washed out most of the parking lot and much of the trail system. The power of nature! We retired to the MoHo exhausted from our full day. Not much to do this morning to get ready to leave, since we were boondocking. Not the usual chores that we are used to. We did stop at the “sani-dump” in the park to take care of our tanks and fill up with water for the days to come. Nice that they offer this service. This drive was one of the prettiest I have ever been on. It connects Jasper to Lake Louise (Jasper National Park to Banff National Park). One amazing landscape and view after another! If it weren’t for this, today could have been classified as the ultimate cluster. Turns out that we needed to get fuel. We mistakenly passed the only gas station on the Parkway, so we took the next exit as we thought there would be a pullout or turnaround no problem. About 15 minutes down the road we realized this was not the case. We had to pull over and unhook the car since we are not able to maneuver/backup/u-turn with the car in tow. All of this logistics stuff with the vehicles makes me extremely anxious. We successfully unhooked, I got in the Acura, Mike in the MoHo and we turned around and made it back to the gas station where we proceeded to pay $6.50/gallon for diesel. Needless to say we only put in the bare minimum. Have we said how expensive Canada is?! Found a place to hook back up and we were on the road again. Along the way we decided to stop at Peyto Lake. This is another place I had read about and wanted to visit. Most of these larger sites have had ample parking for large rigs, so we thought no problem. We drove up to where buses park as we thought that would be best, but instead got stuck again. Had to ask a large bus to move for us so we could get through. Again, this all makes me extremely anxious. The guy did it reluctantly and we hightailed it out of there without being able to stop and sightsee. At this point. I think both of us were ready to get to Banff. The last ‘incident’ was both good and bad. We approached what seemed like a traffic jam on the Parkway. This can mean only two things – construction or wildlife. A black bear was near the roadside munching on some foliage. People lose all sensibility (we also saw this over and over in Yellowstone). Cars parked in the middle of the road and people standing less than 10 yards from this animal taking photos. I thought Mike was going to come undone. He honked our big MoHo bullhorn hoping these idiots would move their cars to the shoulder, but no one seemed to care. We were stuck and could not get by and traffic stacked up behind us. This actually worked out ok as we were able to get some good pics and being up so high, we had a great view. Finally we moved on, but at this point, we were ready to get the rig parked and be done with the drive. We pulled into Tunnel Mountain Campground in Banff (we had power here, but no water or sewer) to a killer thunder/lightning show and headed into town for dinner. Granted it was a Saturday night, but town was a complete circus. So crowded, but really fun. This place is the ultimate little tourist town with a fun ave (Banff Avenue) with tons of shops and restaurants. We continued with our Brewery theme and settled into the Banff Brewery for a bite. The Sounders were playing Toronto on the big screen so it was a treat since we had been without TV for awhile. We had a much needed leisurely morning and decided today would be a good day for golf. Something completely relaxing in a beautiful setting. Golf at the Banff Springs resort was way too expensive so we drove west toward Calgary and the town of Canmore. We golfed at Stewart Creek and got paired up with a single, Shawn, a local kid. This always makes me nervous to play with someone I don’t know, but he was so easygoing and it really made for a great round. This area, which is very close to Calgary, was really hit hard by the big flood in June. Much of the golf course was washed out, but all but one hole was completely repaired. We had heard about this flood, but seeing the devastation first-hand was pretty eye-opening. We got off the course around 8 and headed back to the MoHo to watch the PGA tourney that we had recorded earlier. We both fell asleep early. Woke up the next morning and finished watching the golf tourney. Drove to Lake Louise. Wow, there were a lot of people there! We walked down the hill and there it was. That picture I have had in my head: Chateau Lake Louise, the piercing blue colored lake with the mountain/glacier framed in the background. It was spectacular. We did a hike up to the Teahouse, 3.5km straight up, but well worth it. Once on top, there was a little restaurant serving coffee, tea and snacks. Very cool. A huge rainstorm started up, so we thought we better make our way down. It was a pretty strenuous hike for us. On our way down, we chatted about how glad we were to be doing this trip now vs. 20 years from now…20 years from now we wouldn’t be able to do this hike. This is a pretty regular conversation for us and confirmation on why it makes so much sense that we are doing this trip now! We drove back to Banff and decided to go to the Banff Springs Hotel for dinner/drinks. This hotel is the one we have all seen photos of – it looks like a castle in the trees. It was a splurge for us, but the atmosphere and setting just couldn’t be beat. We sat out on their patio and took it all in! Today was a banner day! 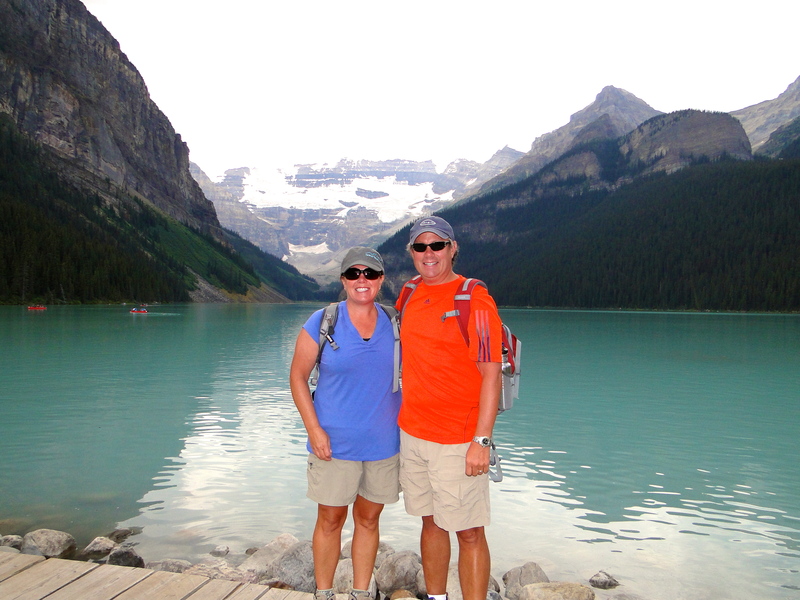 The next day, we headed back toward Lake Louise to Moraine Lake. This is the other recognized lake in all the pictures. 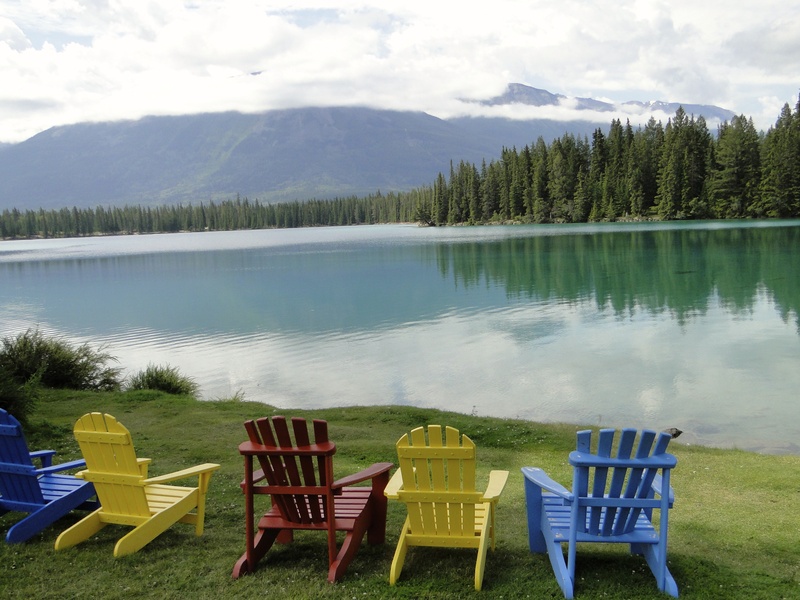 It is a vibrant turquoise blue whereas Lake Louise is more of a milky, ice blue. Mike thinks Moraine is more impressive than Louise. We got rained on again, but it cleared pretty quickly and we were then treated to blue skies and sunshine. We were both a bit sore from our hike the day before, so decided to just do the easy trail along the lakeshore, 3 km roundtrip. There are some other hikes in the area, but due to bear activity, they require hiking in groups of 4 or more. We could have hooked up with some others, but this seemed like a good excuse for us to pass on these hikes! We headed back to the Banff area and up to Lake Minnewanka to explore some more, but most of the area and trails were closed due to bear activity. We decided to go back to the campground and enjoy our site and the sunshine. Mike made a delicious Caprese Salad and we opened a bottle (or two) of Rose from the Okanagan and sat outside in the sun until the mosquitos drove us inside. We both took showers in the campground facilities since we need to be mindful of our water usage. Another great day. On our last day, we had a really relaxing one. Did some MoHo chores in the morning, then into town for lunch, strolling the ave and Starbucks for free wi-fi. Back to the campsite for a nice long walk, watched the Mariners and a light dinner. We have been in Canada for 2 weeks now. I absolutely loved this part of trip. It was the perfect mix of relaxation and seeing all of the sights I have dreamed of seeing. I also felt like we were pretty active which is always nice – 10,000+ steps every day! I would highly recommend this area for a visit – it really isn’t that far from Seattle and so worth it. The scenery really does rival Alaska. 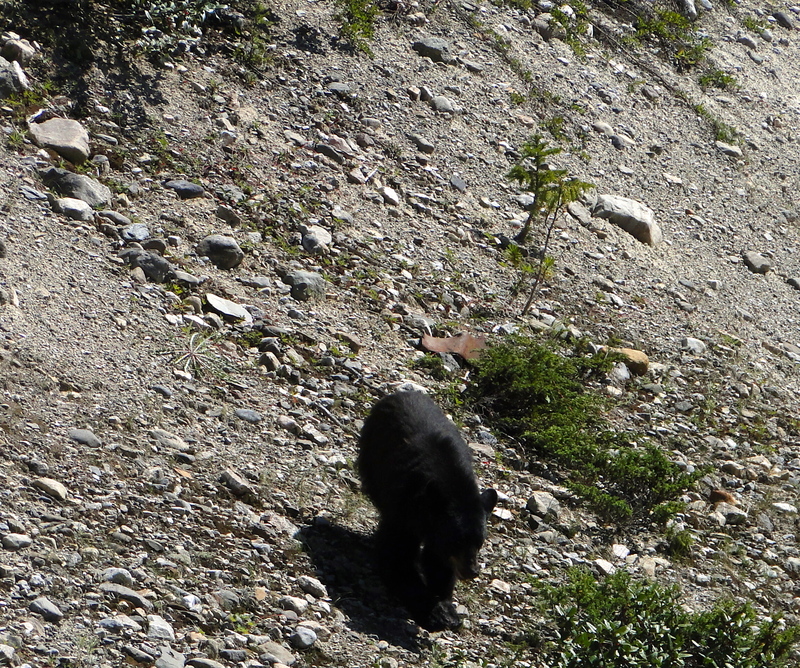 The only bummer is that we did not see much wildlife – only the one bear. Looking forward to getting back in the US! Thanks for reading. Remember to let the photos load and if you want to view them as a slideshow, just click on the first pic, then scroll through with your arrow keys. 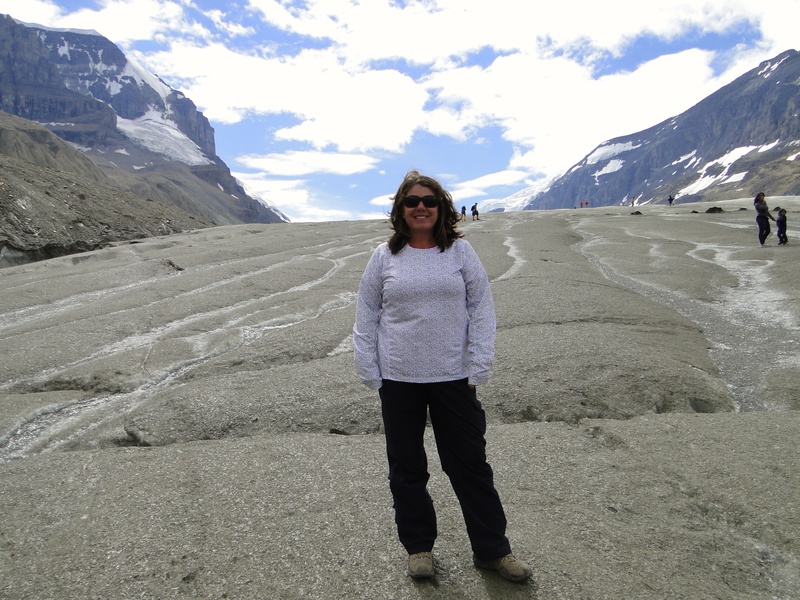 This entry was posted in August 2013 and tagged Banff National Park, Bears, Bucket List, Canada, Icefield Parkway, Jasper National Park, Lake Louise on August 15, 2013 by Traci. We left Casa de Pflu after a fun-filled couple of days and headed north to Canada. Our drive was an easy one, and we got to the border crossing assuming the worst. We had read and heard that they would board the MoHo and do a very thorough search, not so for us. We answered a few simple questions and were through in only minutes, too easy. Driving through southern BC and the Okanogan Valley we did not realize how many orchard’s and vineyard’s were there, a real surprise. Seemed like there was a fruit stand or winery every kilometer or so, and they were all busy. We got to Summerland BC, staying at the Summerland Beach RV Park. A college friend of Traci’s parents live there and were able to get us a site in the campground – thanks so much to the entire Webert family! Al and Joan were great hosts, especially when we could not find a place to land because it was their “long weekend,” a three-day holiday we knew nothing about and everywhere was full. The first night there was a lot of thunder and lightning in the area and two of the strikes actually started small fires across the lake from us, soon put out by the heavy rains that followed. But, interesting to see how simply a fire can start with just one strike. The next day was similar, bit cool and showery, so we decided to stay indoors and do some wine tasting in Naramata, just on the east side of Lake Okanagan. (The entire region we were in from 50 miles north of us and 50 miles south is a huge wine region, for those who want to give this area a try, we would highly recommend). 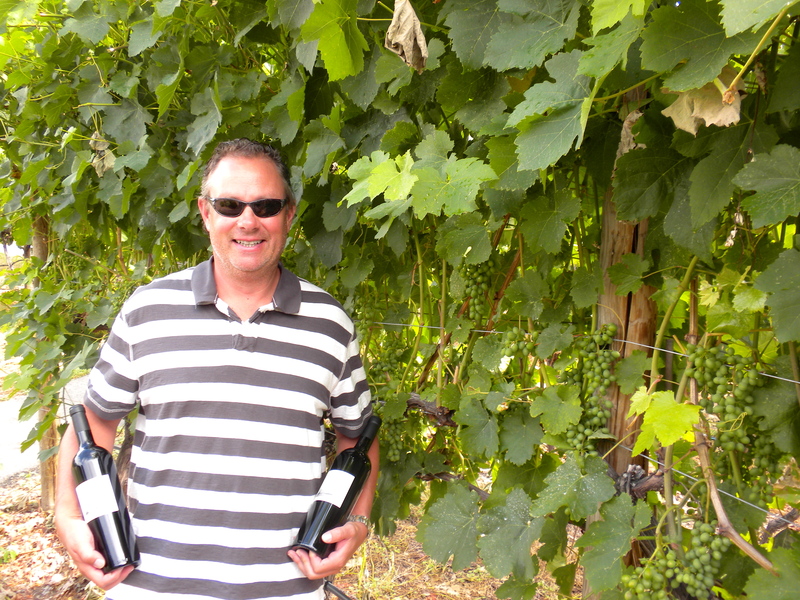 We went to 5-6 wineries and met some very nice people, especially Sal D’Angelo, owner of D’Angelo Winery. A wine maker of some 30 plus years, he was just finishing a Bocce court when we pulled up and he made sure to greet us and take us into his wine shop. After going through the tasting, he brought out a very nice port style desert wine, wanting to share this with us, without his daughter who runs the shop, knowing. I wanted to buy some of the port, but with no label he could not sell it, bummer. We bought our wine and just at the last minute he offered me a bottle of the port and I could not get my cash out fast enough! This area was beautiful and we would like to spend a whole lot more time on the “bench” as it is known, but you can only taste so much wine in one day. The ones we visited were: Therapy, Elephant Island, Black Widow, Ruby Blues, La Frenz and D’Angelo. We finished the day cooking back at the MoHo, and some wine from the days travels. The next day we thought about some golf, but could not get going early enough, so off for some more wine tasting, this time in Summerland. We had a small map (Bottleneck Drive) and I saw a listing for one that looked like it was right on the lake – Greata Ranch Estate Winery. Located right off highway 97, overlooking Lake Okanagan. Nice little shop, average wine, amazing views. We decided to have a quick bite, and polished off a bottle of wine on the deck with the yellow jackets helping us – bad year for those little nuisances up here. A few more stops, Sumac Ridge and Silk Scarf (the best wine we had), and we ended at a winery called Dirty Laundry. Another great view from this place, and because of the holiday weekend, it was so busy we just bought a couple of glasses and drank them on the deck overlooking the valley. 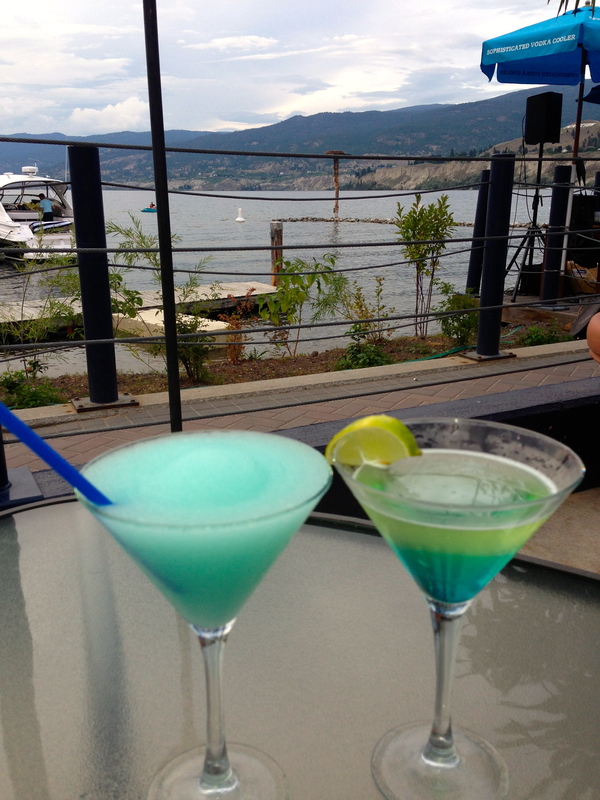 Finished the night down in Penticton for dinner, at the Barking Parrot bar out on their summer patio in the marina with a couple of local guys playing music on the water, very nice ending to a great day! 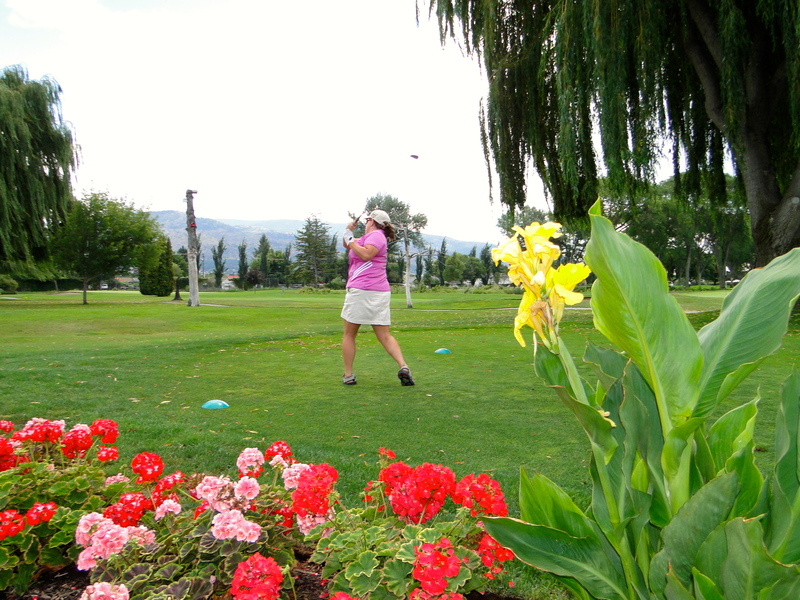 The following day we got in some golf at the Penticton Golf and Country Club, a shorter local municipal course that everyone seemed to know each other. We were clearly out-of-towners, and several people made note of helping or giving some sort of tips, golf, food or otherwise. It was nice to see how friendly everyone was and how they went out of their way to assist and offer advice. Got home and Al came buy to invite us to dinner at one of their favorite spots and we went with him and Joan and the rest of their family who were visiting. Good food, great wine, and wonderful conversation, all capped by some more wine back at their place in the campground. Next morning we were off to a small little place in McClure BC, Pinegrove Campground & RV Park, about 40 kilometers north of Kamloops for a few nights till we head to the Canadian Rockies. We got set up after a bit of maneuvering to a very nice pull through site and the owners, Randy and Martina, were very helpful from the beginning. 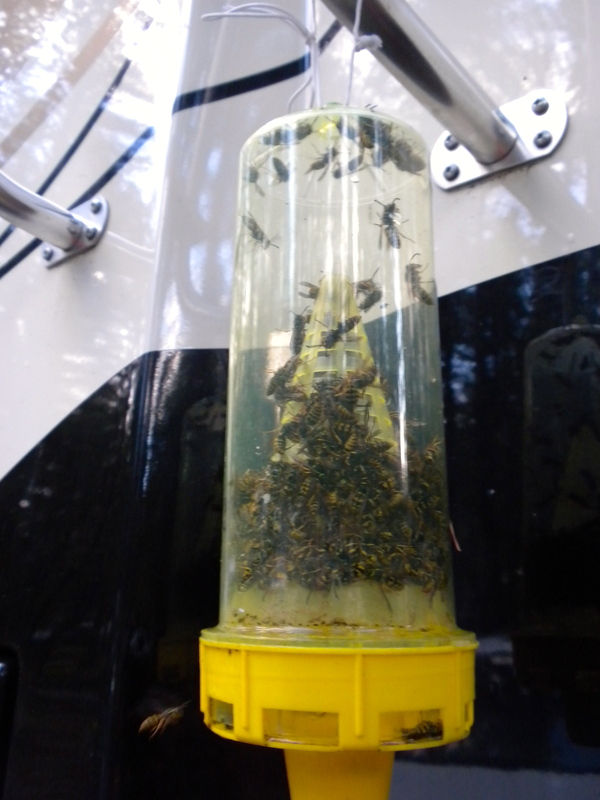 We relaxed most of the afternoon and immediately noticed the bee issue here as well, so I got out my bee trap I had at the old house and set it up off the back of the MoHo. Randy mentioned it was a super bad year for the yellow jackets, and he proceeded to make a few traps the old fashioned way, 2-liter bottle with the top cut off and inverted back into the body and some sugar water to attract the little bastards. Within minutes of my trap going out, it was a hit with the bees and they were swarming the trap instantly. The neighbors, John and Ronna-Lee, and Randy all noticed and suddenly it was a nice topic of conversation for everyone. We started to chat, and an hour later we were all sitting around our propane campfire pit. One thing led to another and someone brought out the Tequila and it was all down hill from there! (We left all of our adult beverages back in the states as we read the amount of duty we would have to pay if it was found on our entrance to Canada, so we did not have anything to share or we all would have been in deep trouble the next morning!) Great campground hosts/owners, wonderful camping neighbors, and better conversation was had till almost 12:45AM. Today, we went into Kamloops to pick up a few supplies (shopping in Canada is expensive: 12 pack of BL Cans = $24; box of Kashi cereal = $7) before we head to Jasper and the Canadian Rockies portion of our adventure! The amount of bees we trapped in a 24 hour period. On our trip to the campground north of Kamloops, we were really searching for some propane. When we get a bit further north, most of the campgrounds we will be staying in we have to boondock (maybe power, or maybe water, but no sewer hook ups.) We run the fridge on propane when driving or when there is no power to hook into. We also use it to cook and occasionally to heat the water for the shower, so it is important to have as much as we can when we get “off the grid” in some of the areas further north. In searching for the propane filling outlets, we could not find anything easy. The propane fill location is on the bottom of the drivers side of the MoHo, so we really have to get close to the supply tank when filling up. About 40 kilometers from Kamloops, we saw a small gas station with a pull through perfect for me to get the needed propane. Well at least I thought it was perfect….. oh *&%$* I did not make the turn wide enough and now the car was blocking the highway behind me and there was a tree 2 feet in front of me! Damn, I have jackknifed the car behind us, can’t move forward or backwards, we are officially stuck. (I did move it forward enough to get out of the highway, but just barely.) We now had to do our first emergency disconnect of the car – on an extreme incline, I am an idiot! Took several stress filled minutes, and we finally got it disconnected, and it left Traci pretty anxious. Lesson, fill your propane at the truck stops with tons of room to maneuver! 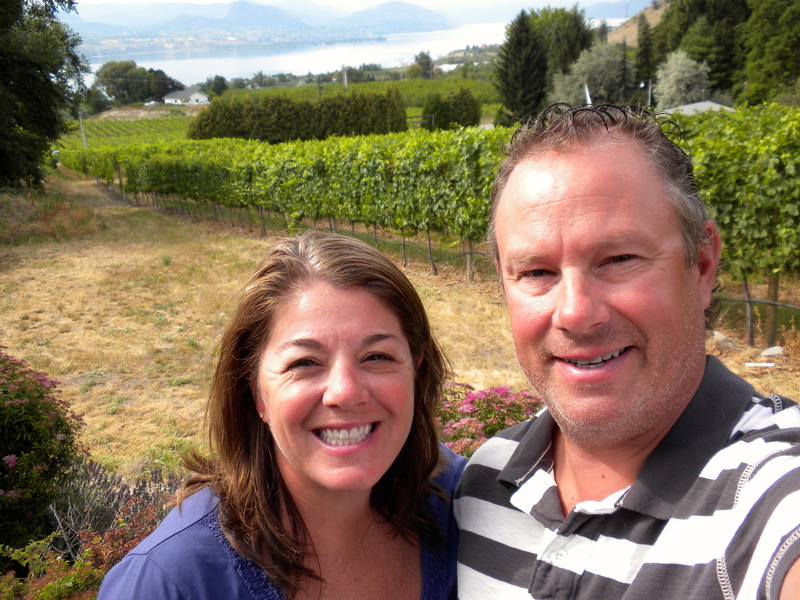 This entry was posted in August 2013 and tagged Bottleneck Drive, Canada, Golfing, Lake Okanagan, Naramata Bench, Penticton, Summerland, wine tasting on August 6, 2013 by Mike.